The good humour of the crowd – singing “We still love you even though you’re No” at a tiny group of No voters – the mood of celebration, the feeling of potential, of power, are amazing. There couldn’t be a greater contrast to the increasingly desperate begging and wild threats by Britain’s rulers, who fear the Yes campaign will win and smash up the British state. All three of Britain’s main political leaders – the gruesome trio of Cameron, Miliband and Clegg – have scooted off to Scotland to see if a bit more patronising rhetoric, and another demonstration of just how rotten the Westminster consensus is, might somehow boost the No vote, turn back the tide and “save Britain”. The BBC has switched to full-on voice of empire mode. The “Better Together” campaign to preserve the British State as it stands has wheeled out the cliches, the celebs, even the queen – because nothing says democracy and respect like an unelected head of state who lives a life of luxury funded by the taxpayer. 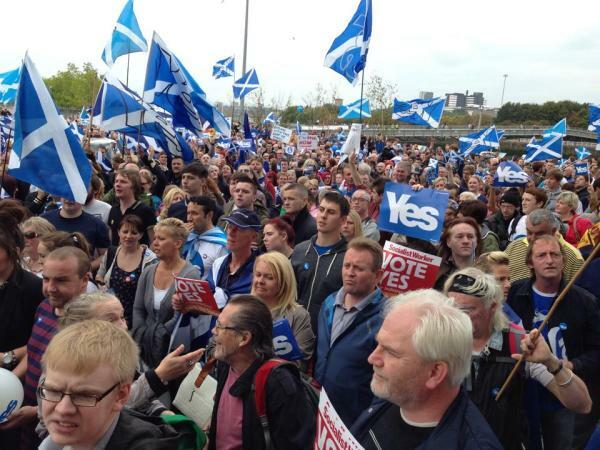 Millions of people in Scotland, cheered on by many of us and down here in – what shall we call it now? Lesser Britain? – are looking towards independence because they want change, a better life for ordinary working class people. Most of the Yes voters are motivated not by nationalism, and certainly not by chauvinism, but by a desire to wrest back some democratic control over their lives. This, for many voters, is a class issue. There’s a chance for Scotland, where Tory votes are scarce, to rid themselves of Conservative rule – quite possibly for ever. There’s a chance to get rid of Trident, the obscenely expensive nuclear submarine fleet used to prop up Britain’s pretence at imperial power and to encourage continual warmongering. There’s an opportunity to tell all the wasters of Westminster to get lost. I hope they take it – Yes Scotland! You will get a chance to make something new up there – but I think a Yes victory will blow politics wide open north and south of the border. It’s not only in Scotland that people are sick of the Tories, sick of workers being made to pay for the economic crisis, sick of our wretched politicians – we’re fed up down south too. And there will be repercussions elsewhere too as the enormous demonstrations in Catalunya have shown. Scotland’s vote on 18 September is too close to call. But here’s hoping!